While I was in graduate school at Tufts for nutrition (2004-ish), I discovered my love for fermented foods and learned how to make kombucha. 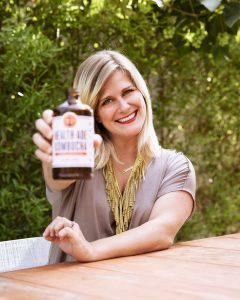 Real, holistic, fermented foods just made me feel good, so I was hooked and making my own kombucha since then. I recently went to Mexico City and tried Nopa Kombucha. Their “Jamaica” flavor is seriously delicious, and they ferment in 2.5 gallon glass jars, just like Health-Ade! In addition to being the CEO of Health-Ade, I am a wife to my wonderful husband, Justin and a mom to a very active 3 year old, Hendriks. Being a mom is definitely a job in itself, and it can be a struggle to balance it all and still take time for myself. I love spending time with my family and friends, cooking, playing in the back yard, and just being together. If I can squeeze in time to work out, I really feel like I have it all. Everything that you need you already have inside of you!